Catholicism is deeply rooted in the New Orleans identity. It was the Ursuline Nuns who were the first women to brave the wilds of the New World and, without them and their influence on the fledgling city, it is difficult to say if the colony would have survived at all. Lord knows everything was against them in those early days… but that’s probably a story for another post. Churches have existed at the site of the current convent since around 1734 and the structure that currently stands on the spot is generally thought to be the oldest building in the region. Over the years, it has served as a shelter, home and haven for the residents of New Orleans, and the Ursuline’s have been teachers and carers for orphans and the indigent. In the current day, the convent houses the records for the Catholic Dioceses and is open for tours to the public. If you were to try and identify the cause for the persistent rumours of ghosts, vampires and haunting’s which swirl around the convent like whispers through time, you might like to start with Casket Girls, who according to New Orleans folklore, arrived in the city in around 1727. These ladies were sent to the colony from their native France, with the express purpose of becoming wives to the male settlers of the area. Now these guys were deeply depressed by the lack of available females that the New World had to offer… so depressed they couldn’t even work to build the city, they just wanted to sit around and drink and gamble all the time. You really feel for them, don’t you? The poor bastards. Well, that’s one version of the story anyway. In that version, the men were at first heart broken, and then curious when priests from the Catholic Church showed up to collect the caskets, saying nothing, only loading them on to the back of a cart and taking them back to the Ursuline Convent. Sadness soon turned to drinking, turned to despair, turned to superstition and, before long, the gents are convinced that the caskets were actually housing vampires (it’s a logical progression, guys!). Obviously, this meant that the vampire bodies of their prospective brides were now being housed in the attic of the convent and had fallen under the watchful eye of the Ursulines. Being that the Catholic Church was all powerful, there wasn’t a fat lot any drunken sailor could do about the whole scenario and thus, they did nothing except sit and tell ghostly stories about the lovers they might have had. As for the vampire girls? Well, rumour is that they’re still in the convent today. If you rewind a little way, say back to the ship docking in port, there is another version to this story and it says that the ship did arrive, with living girls on board. These girls were turned over the Ursuline nuns, who were to care for them until suitable husbands could be found. There are few records to determine who these girls were, who they married or what happened to them once they left the convent though, which makes this mystery a little more interesting. It’s hard to say, either way, what became of the young women and what kind of lives they had. But hold it, we’re not quite done yet…. Wait on though, because we’re still not done…. Yet another version of the casket girl story (my favourite) suggests that the ship carrying the girls arrived into the port, with the girls (alive) and their caskets (still casket shaped). The girls got off, in possession of their precious cargo… which actually housed vampires, bought over to the United States from the Old World. In this legend, the girls went to the convent, where they were safe. The vampires went out into society, where they started new lives and continued on as the living dead, having a wonderful time feeding on the transient population of the area. From time to time these vampires went back to the girls, who in an effort to keep them out of the convent, nailed the attic windows shut. The girls lived out their mortal lives and then passed on to the next world. The vampires? I like to think they’re still having a glorious time of things in the French Quarter. In fact, every time I’m down that way and near the convent, I hope to run into one, who might be reliving the glory days of when he first came to the New World. Keeping vampires in? Keeping vampires out? Housing vampires at all? It is of course, also totally possible that the vampire myths and legends that are tied to the convent have something to do with Catholicism and the general dislike of it from those outside of the faith (then, not and forever). For its part, the Catholic Church certainly seems to think that these rumours came about with the express intention of discrediting the reputation of the religion within the wider community. But then again, what else could they say? Admitting vampires exist? Couldn’t have that! If you’re on a walking tour of the French Quarter, odds are that you’re going to end up here at some point, although the content of the history you’ll hear may differ, depending on the greater thematic interest of your tour. I’ve done pretty much all of the walking tours that are on offer and have read one or two books on the historical French Quarter as well, so I am familiar with many of the ghostly stories that surround this building. Among my favourites (note, I said favourite, not historically accurate) is that which you will likely hear if you take the Haunted History Vampire Tour. When I took the tour, Jonathan was my guide and he really was exceptional. If there is a lore or legend about vampires that he hasn’t heard, I’d surely be surprised. This is a man that is clearly interested in vampire mythology and who has a deep love for the French Quarter, factors which are pretty important for a tour guide. Additionally, he approached historical beliefs and folklore from a logical perspective, rather than one which embraced a supernatural explanation. I don’t want to ruin the tour content, so I’ll just say that if you’re in the area, you should certainly invest the $25USD for this tour. Go in the evening, wear comfortable shoes and try to think of some pointed questions to ask or some lesser known vampire lore to bring up – it will really enrich the experience. On my last visit, I also took the self-guided tour of the convent grounds and interior and must say that I found the ladies that operate the ticket booth very kind and knowledgeable about the convent and the various eras of its history. Getting inside the convent is pretty awesome, although finding out that the mysterious upper levels are closed to the public really took the wind out of my sails. How am I ever going to be able to go vampire hunting if I can’t get into the vampire hive? 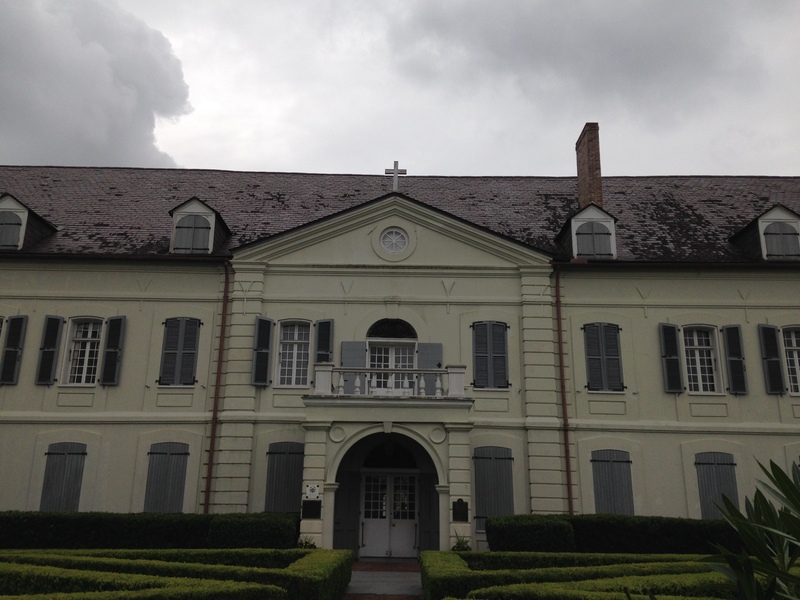 The top attic of the convent has been closed to the public for the last ten years, after storm damage suffered during Hurricane Katrina did major damage to the structural integrity of the upper floor. That makes me sad, but I guess it gives the vampire rumours a chance to continue on into the future and, to a point, it is often more fun to wonder what might be up there as opposed to knowing what is. If you’re happening through the gates to do some exploring of your own, I’d suggest taking some time out to tour the chapel and the gardens, which are not surprisingly, superbly manicured and kept. The interior of the convent offers a great deal of information about the voyage of the first Ursulines, as well as the initial statue of Mary which they bought over with them from France (that’s one old statue!). There are also rooms dedicated to an historical look at Hurricane Katrina, its effect on the city and the aftermath of the event. In the rear garden there are a number of statues of past members of the Ursuline family, of particular interest is Henriette DeLille, who is in the process of canonization, which will make her New Orleans first Lady Saint (for the non-Catholics out there, that is a pretty big deal, in order to be declared a Saint you have to meet a fairly specific set of criteria, including being able to prove that you have worked 3 miracles. No small feat!). With so much history, it possible that the high fences and security cameras surrounding the convent grounds function to keep undesirables out, as well as to keep the vampires in….